Special starts October 15, 2008, 00:00:01 (+0800 GMT). Hook bigger sales and savings when you offer free postage (also known as “free shipping” on some eBay sites) during this year-end shopping season. Everyone loves getting something for free and there’s also the added simplicity of an all-in-one price, with no hidden costs. 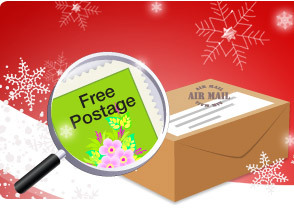 That makes free postage a great way to bait more buyers and haul in more sales! Plus, you can now also net fantastic savings. Enjoy 10% off Final Value Fees (FVF) for all Auction and Fixed Price items you list that offer free postage. Get this great offer on two exciting, international eBay marketplaces, eBay.com and eBay.com.au. Please note this special is exclusively for Singapore, Malaysia, Philippines, Thailand, Vietnam and Indonesia residents only. All other fees will still be charged. All listings on the US eBay Motors site (www.motors.eBay.com) are also excluded from these promotional fees. These promotional fees also do not apply to listings with a start date prior to October 15, 2008 - including those listings revised during the promotional period. These promotional fees also do not apply to listings created during the promotional period, but scheduled to start after the promotion ends. How do I get this special? The discounted final value fees will be visible in your View Account Status page when the listing is sold. 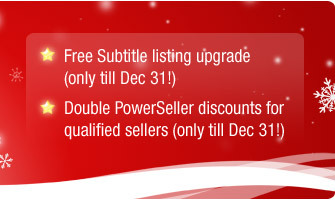 For sellers using third party listing tools, you will see the discount in the View Account Status and My eBay pages.